The consequences of Defense Secretary Leon Panetta’s loose lips with secret information about the informant in the assassination of Osama bun Laden in Pakistan, has put many lives at high risk. It seems that Leon Panetta’s approval of and subsequent public confirmation of Afridi’s vaccine ruse is a problem that just continues to affect the lives of more and more children every day. Although the Pakistani government’s vaccine drive is legitimate and urgently needed, Panetta’s poor judgment is putting that drive at risk and assuring that it will fall far short of the rate of vaccination needed to prevent a record year for polio cases in Pakistan. The consequences are that the informant, Pakistani doctor Shakeel Afridi, was jailed for 33 years in May, 34 million children are at risk and trying to save those lives can get you killed. MR. Panetta should be sentenced to driving doctors and aid workers in North and South Waziristan for the rest of his life. I’ve refrained from commenting much on the state of the economy over the last couple of years because it seems to have been largely irrelevant to the direction of many widely followed markets. While bonds, particularly the highest quality bonds, have continued to rally over time, par for what you’d expect in an economy facing deflationary pressures, on a day to day basis, bipolar risk on/off reactions have held sway. And even though there is no reason to expect anything better that a weak recovery in the wake of a balance sheet recession afflicting the world’s advanced economies, a peculiar tendency to look to ordinary recessions for comparisons plus undue faith in the confidence fairy has led many commentators to draw trend lines through improving data series and declare it to be a recovery. However, we seem to be at or may even have passed an inflection point, and policy makers seem remarkably unprepared to take action. While the result may indeed be a technical recovery, with official unemployment at over 8%, and U-6, the broad measure of unemployment, showing more deterioration of late than the headline figure (it’s now at 14.9%), there was hardly much cause for cheer. Both in 2010 and 2011, improvements in economic performance that were hailed as real recoveries faltered. With youth unemployment high, working young adults saddled with high student debt loads, household formation low due to more multi-generational households and older adults contending with diminished wealth thanks to hits to home prices and retirement savings, consumers were not able to be the drivers of renewed growth unless their wage and employment situation improved in a marked fashion. And that just isn’t happening. Americans have been protesting and getting arrested at U.S. drone bases and research institutions for years, and some members of Congress are starting to respond to the pressure. But it’s not that drones are being used to extrajudicially execute people, including Americans, in Afghanistan, Pakistan, Yemen and Somalia that has U.S. lawmakers concerned. Rather it’s the possible and probable violation of Americans’ privacy in the United States by unlawful drone surveillance that has caught the attention of legislators. Rep. Jeff Landry, R-La., says “there is distrust amongst the people who have come and discussed this issue with me about our government. It’s raising alarm with the American public.” Based on those discussions, Landry has placed a provision in a defense spending bill that would prohibit information gathered by drones without a warrant from being used as evidence in court. No one in Congress, however, has introduced legislation requiring the government to provide to a neutral judge evidence of a criminal act committed by a person to be targeted for assassination by a drone, or allowing such a person the right to defend himself against the U.S. government’s allegations. In a 1993 article published in the media watch group FAIR’s Extra! magazine, 17-year-old intern Kimberly Phillips criticized Seventeen magazine’s preoccupation with fashion and beauty, and its failure to encourage young women to think about important issues. Balking at the criticism, Seventeen’s managing editor responded with a defensive letter to the editor, insisting that the magazine’s focus on appearance was consistent with the interests of its adolescent readers. Nearly 20 years later, almost nothing had changed – until now. Within the span of two months, a 14-year-old Maine girl named Julia Bluhm mobilized more than 80,000 supporters to lobby Seventeen to commit to a more modest goal: printing one photo spread per issue without an unaltered image. Bluhm’s efforts are part of Sexualization Protest: Action, Resistance, Knowledge or SPARK, a girl-fueled activist movement that is demanding an end to the sexualization of women and girls in media. It can seem like just a mirage created by the summer heat: only a few weeks ago the Supreme Court actually handed down a decision that progressives could celebrate. It held that the Affordable Care Act is constitutional, including the individual mandate, meaning that implementation can roll on full steam ahead. I was one of the first to celebrate, in particular for all the ways that the law will help women who need healthcare (which is all of us). As Katha Pollitt recently wrote here, women will benefit dramatically from the ACA. The law bars practices like charging women more just for being women, dropping women’s coverage if they become pregnant or sick, and denying coverage due to “pre-existing conditions” like having had breast cancer or being a victim of domestic violence. It adds new benefits like birth control coverage at no cost to the patient, expanded coverage of preventative services like prenatal care, mammograms, pap smears and bone-density screenings through Medicare, and requiring insurance companies to cover maternity care. But one aspect of the Supreme Court’s decision could have some very bad results for women: the ruling that states can opt out of the Medicaid expansion. While this could end up harming men and women, women in particular stand to suffer if states refuse to participate in the program. The bank failed to monitor a staggering £38trillion of money moving across borders from places that could have posed a risk, including the Cayman Islands and Switzerland. The failures stretched to dealings with Saudi Arabian bank Al Rajhi, which was linked to the financing of terrorism following 9/11. HSBC’s American arm, HBUS, initially severed all ties with Al Rajhi. But it later agreed to supply the Saudi bank with US banknotes after it threatened to pull all of its business with HSBC worldwide. According to the report, HBUS also accepted £9.6billion in cash over two years from subsidiaries without checking where the money came from. The Senate probe also examined banking HSBC did in Saudi Arabia with Al Rajhi Bank, which the report said has links to financing terrorism. Some of the money that moved through HSBC was tied to Iran, the report said, which would violate U.S. prohibitions on transactions tied to it and other sanctioned countries. 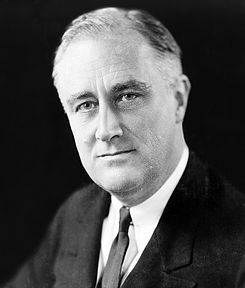 On this day in 1940, Franklin Delano Roosevelt, who first took office in 1933 as America’s 32nd president, is nominated for an unprecedented third term. Roosevelt, a Democrat, would eventually be elected to a record four terms in office, the only U.S. president to serve more than two terms. Roosevelt was born January 30, 1882, in Hyde Park, New York, and went on to serve as a New York state senator from 1911 to 1913, assistant secretary of the Navy from 1913 to 1920 and governor of New York from 1929 to 1932. In 1932, he defeated incumbent Herbert Hoover to be elected president for the first time. During his first term, Roosevelt enacted his New Deal social programs, which were aimed at lifting America out of the Great Depression. In 1936, he won his second term in office by defeating Kansas governor Alf Landon in a landslide. The two-term tradition had been an unwritten rule (until the 22nd Amendment after his presidency) since George Washington declined to run for a third term in 1796, and both Ulysses S. Grant and Theodore Roosevelt were attacked for trying to obtain a third non-consecutive term. FDR systematically undercut prominent Democrats who were angling for the nomination, including two cabinet members, Secretary of State Cordell Hull and James Farley, Roosevelt’s campaign manager in 1932 and 1936, Postmaster General and Democratic Party chairman. Roosevelt moved the convention to Chicago where he had strong support from the city machine (which controlled the auditorium sound system). At the convention the opposition was poorly organized but Farley had packed the galleries. Roosevelt sent a message saying that he would not run, unless he was drafted, and that the delegates were free to vote for anyone. The delegates were stunned; then the loudspeaker screamed “We want Roosevelt… The world wants Roosevelt!” The delegates went wild and he was nominated by 946 to 147 on the first ballot. The tactic employed by Roosevelt was not entirely successful, as his goal had been to be drafted by acclamation. The new vice presidential nominee was Henry A. Wallace, a liberal intellectual who was Secretary of Agriculture. In his campaign against Republican Wendell Willkie, Roosevelt stressed both his proven leadership experience and his intention to do everything possible to keep the United States out of war. In one of his speeches he declared to potential recruits that “you boys are not going to be sent into any foreign war.” He won the 1940 election with 55% of the popular vote and 38 of the 48 states. A shift to the left within the Administration was shown by the naming of Henry A. Wallace as Vice President in place of the conservative Texan John Nance Garner, who had become a bitter enemy of Roosevelt after 1937. This Tour is basically over with commanding leads in both the General Classification and Points but if anyone is going to make a move in the GC it’s either today or tomorrow in the Pyrenees or in the Individual Time Trial the day before the Champs. It’s this (yawn) gripping duel in the High Mountains you see that justifies the absurdly early 6:30 am coverage start. The Mountains will certainly be high enough, 2 uncategorized, 2 category 1s. The Award point is mercifully early before any of the climbs, it could be some Sprinters won’t make the time boundary. Newly not appearing for the 16th Stage are Sylvain Chavanel, Brett Daniel Lancaster, Yauheni Hutarovich, Kenny Robert Van Hummel, Vincent Jerome, and Giovanni Bernaudeau. Monday saw Pierrick Fedrigo take a 4th French stage win with Christian Vande Velde second and Thomas Voeckler third. No changes worth mentioning at the top. Coverage is customarily on Vs. (NBC Sports) starting at 6:30 am with repeats at noon, 2:30 pm, and 8 pm. There will be some streaming evidently, but not all of it is free. This set covers Points from Stage 13 to Stage 15. This set covers Points from Stage 8 to Stage 12. So I was telling you about evil tables and overflow errors. I was able to crank out consolidated ones for Team, Hill Climbing, and Youth. Tonight I’ll attempt to assemble a complete data set. I’m dividing it into chunks to make debugging easier and to identify true overflows (there’s a lot of information and the formatting is not trivial). This particular group has all been previously published and covers Point standings until Stage 7. I hope to follow shortly with the other daily Point standings and then with General Classification tables and Team, Hill Climbing, and Youth (also to date).